i love indian food. i tried it for the first time when i was in college, + have been hooked ever since. there are so many wonderful, exotic flavors + spices in indian cooking + with lots of rich, savory sauces + curries, it’s total comfort food for me. 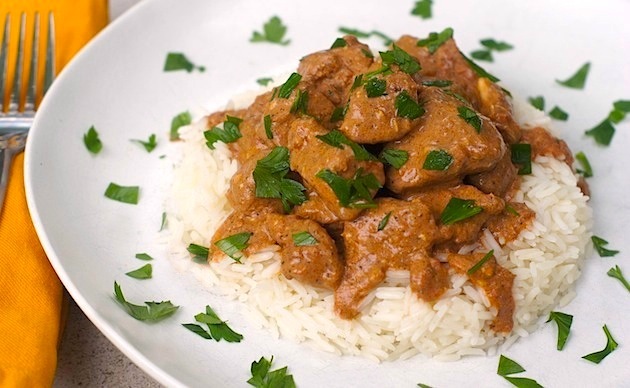 until recently, i hadn’t tried making much of it at home, but when i was perusing slow cooker recipes to make with my new crock-pot, i stumbled across a recipe for slow-cooker chicken tikka masala + knew that i had to try it ASAP. so how did it turn out? AMAZING! if you’ve never had chicken tikka masala before, allow me to describe: it’s pieces of tender, juicy chicken marinated in yogurt + spices, served in a delicious tomato cream sauce. using the crock-pot to make this made the chicken turn out wonderful – it was literally fall-apart tender, + packed with so much excellent flavor. + the sauce? to die for. full of delightful, savory spices + flavors, with just a hint of spiciness. we served it with both rice AND naan, which turned out to be a wise decision, as we wanted to sop up every last bit of that delicious sauce. i hope that y’all try this soon, whether you’re already an Indian food lover or if you’re someone who still hasn’t tried Indian cuisine. it truly is wonderful + i know you’ll be oh-so-happy you made it! cut the chicken into 1 1/2″ pieces + put into a bowl. sprinkle the coriander, cumin + salt over the chicken, then stir in the yogurt until all the pieces are evenly coated. cover lightly + let sit for 10 minutes before proceeding. melt 2 tablespoons butter in a large saute pan over medium heat. when hot, quickly brown about 1/2 of the chicken. transfer browned chicken to the slow cooker. melt another 2 tablespoons butter in the same pan, brown the rest of the chicken, + transfer to the slow-cooker. put the pierced jalapeno in on top of the chicken. prepare the sauce: using the pan you browned the chicken in, melt the remaining 4 tablespoons butter over medium-high heat. add the onions, garlic, + 1 tablespoon kosher salt, then stir. cook, stirring frequently, until the onions begin to lightly brown around the edges. stir in the garam masala, turmeric, + paprika, + ginger and cook until fragrant (about 1 minute), then raise the heat to high + add the crushed tomatoes + sugar. stir well, scraping the caramelized bits from the bottom of the pan, + bring to a boil. allow to boil for 1 minute, then remove from heat + pour over the chicken in the slow-cooker. cover + cook on LOW for 4 hours if using chicken breasts + 5 hours if using chicken thighs, or until the chicken is very tender. use a fork or whisk to stir the cornstarch into the heavy cream until smooth. pour into the slow-cooker + stir gently until the color is even. replace the lid + let cook for 10 minutes or until bubbly around the edges. salt + pepper to taste (be careful, it’ll be hot! ), then serve with hot buttered rice and/or naan. discard jalapeño before putting leftovers in the refrigerator, as jalapeños can continue to release heat/spiciness into the leftovers over the next few days. Can’t wait to hear what you think of it when you try it – I loved it! Can’t wait to make this with Adam!! We love our crock pot…I’ll have to share a great chicken and dumplings recipe with you!!! Ooh, I would *love* that chicken + dumplings recipe. Would you believe, after 12 years in the South, I’ve still NEVER tried chicken + dumplings?! Must change that soon! Okay, I must try this soon!! I ADORE this recipe. I must’ve gotten a bum jalapeno though, because my dish has no heat. Weird! But LOVED LOVED LOVED the dish! HOOORAY! jalapenos vary greatly individually, so it’s totally possible that the one you had was a super mild one. i’ve had ones that have no heat, then ones that threaten to burn my mouth off my face. oh, the fickle world of jalapenos! but for real, so glad you liked it! Hi, nervous but excited to make my first Indian dish. Is the recipe correct at “3 tablespoons garam masala”? Yes, that amount is correct – 3 tablespoons of garam masala. =) That’s what gives tikka masala its wonderful flavor! Just found your blog and am going to bookmark it! I love tikki masala, but have never made it. Thanks!